Hey book babes! 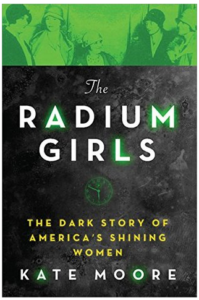 This morning as I was getting ready for work, I was thinking about The Radium Girls. Is this odd? I mean, I finished this book in July! Why am I still thinking about it? Because it was incredible, that’s why. This is easily one of the best books I have read this year; if not, the best. I am still not even sure that I can adequately express how much I enjoyed reading this story. Firstly, I am a huge science nerd but I do not think you need to be in order to enjoy this book; in the end it is a human story. The writing is so smooth, the story so unbelievable and heartbreaking that I would find it hard to believe anyone would not be intrigued by it. I think the author, Kate Moore, did a great service to these women by writing their stories and in such a way that their full humanity, suffering and indeed strength and courage soars through the pages. I read a lot of non-fiction; I love it. I love learning and books that provide a narrative feel to history or social issues are truly compelling to me but this book takes that to a whole new level. It seems to me, a lot of books in this genre are written with more of an outside-observer approach. Ms. Moore’s writing is full of empathy and true feeling for these women’s plight that one would think she knew them personally. Reading this, one cannot help but think her research must have totally engulfed her; I cannot imagine how long it must have taken her to pull all of these facts together into such a gripping account. If you have not read this one yet, you should definitely check it out. Even if you do not normally read non-fiction, step outside that comfort zone and give this one a chance – it deserves it!